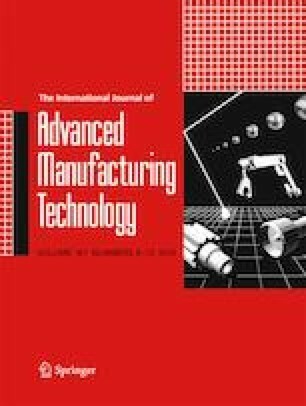 In this paper, a numerical and an experimental approach are established to study the influence of the machining parameters on the resonance frequency shift of ultrasonic assisted turning. The numerical model incorporates the mechanical and electrical effect on the simulation mode shape and resonance frequency of entire ultrasonic equipment. It is numerically shown that the machining parameters’ variability promotes a resonance frequency shifting, and the depth of cut is suggested to have more effect than the feed rate. Experimental results demonstrated that for the same cutting speed and different depth of cut and feed, the frequency value shifts thus compromise the surface quality. With the frequency adjustment promoted by MMM system, surface roughness improves 10 and 14%, when the feed is increased from 0.045 to 0.18 mm/rev, respectively, for a depth of cut of 1.5 mm. This study was supported by FEDER/COMPETE funds and by national funds through FCT and was developed on the aim of the research Post-Doctoral grant SFRH/BPD/76680/2011. Also, this work has been supported by the FCT in the scope of the projects UID/EEA/04436/2013, by FEDER funds through the COMPETE 2020 –POCI with the reference project POCI-01-0145-FEDER-006941 and project CICECO - Aveiro Institute of Materials, POCI-01-0145-FEDER-007679 (FCT Ref. UID /CTM /50011/2013), financed by national funds through the FCT/MEC and when appropriate co-financed by FEDER under the PT2020 Partnership Agreement.